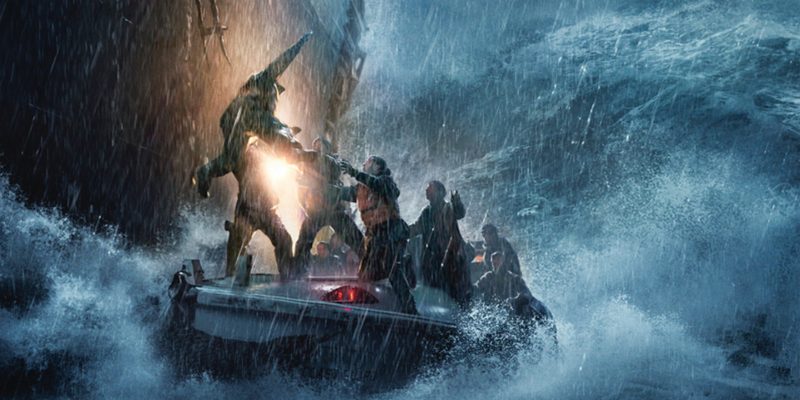 ‘THE FINEST HOURS’ Movie Review – Half a ship can float?? ‘The Finest Hours’ is an Adventure/Drama film based on the true events in 1952 where a Coast Guard off the New England seaboard sets out during a dangerous storm to rescue survivors on the SS Pendleton that was split in half during a storm. Overall this is a pretty decent boat rescue/disaster film that touches on all the main themes you expect from this type of film but never really excels in any department. You have a plethora of characters to potentially care about, you have your suspense, theres some tension, a sense of adventure, a love story, the emotionally engaging scenes, but all of it seems very sub-par, it never reaches a level where i was fully engaged in the story. And it isn’t for a lack of trying, they really go for it and push to have that heavy emotional connection but for whatever reason it doesn’t quite get there. The cast for one you cannot fault, there are a lot of characters and a lot of recognisable actors and all of them did a pretty good job in their roles. The problem being that apart from 2 of the characters, you couldn’t get emotionally attached to any of them, mainly due to the fact that there just wasn’t enough time to really introduce you to everyone and have you get behind them. It really isn’t fair making this comparison but in ‘Titanic’ a lot of the film was focused on the characters and their relationships and it’s the reason why you get very invested in the characters later and care for them when they are in peril. In this film however you can’t really do that as you don’t have an hour to establish everyones characters, and as a result, you mildly care about everyone. But as i said, Chris Pine, Casey Affleck, Eric Bana, Ben Foster, John Ortiz, Graham McTavish, and a lot more were all solid in this film so no fault there. There are some tense scenes and some moments of suspense spread out throughout the film and it does keep your interest for the entire duration but it never gets me to the level of being on the edge of my seat. It leads up to a few very tense moments where it builds and builds and when it gets there it’s just kinda average and then you move on to the next scene. Good, but nothing great. The portions of the story following Holliday Grainger’s character back on land were probably the most uninteresting sections of the film that tended to drag a little and bog down the story. Maybe one or two of her scenes were effective, but a lot of her journey especially the later sections were just kind of dull…. And i don’t think it’s a coincidence that her journey is the one that was the most fictionalised. The visual effects were top notch though so i gotta give it that, it looked like i was watching a real half a ship floating in the ocean, so good job there. In the end though this is a very average boat rescue film that does touch on all the themes and moments you expect it to hit and does so in a way that is good, but not great. Top notch acting and visual effects are among the biggest highlights whereas the biggest lowlight would be the story back at base with Chris Pine’s love which holds down the film. This is a movie good for catching at home one day as it is a pretty good watch but not really grand enough to be a big blockbuster. And once you get your head around the fact that half a ship can still float it’s easier to concentrate on the film.